Modern design, enhanced stability and creature comforts, along with remarkable utility make for a stunning trailerable beach camp cruiser for passionate multihullers. 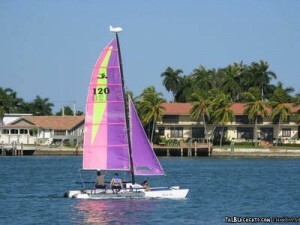 Hobie Alter introduced the Hobie 16 catamaran in 1969 and the sailing world, as it was known, hasn’t been the same since. In 1992, with many of the beach cat lifestyle crowd having families of their own, the Hobie Cat company introduced a new boat called the Hobie 21 SC (Sport Cruiser) that was aimed at the more leisurely needs of beach cat cruising, rather than the well-known, hull flying beach cats. 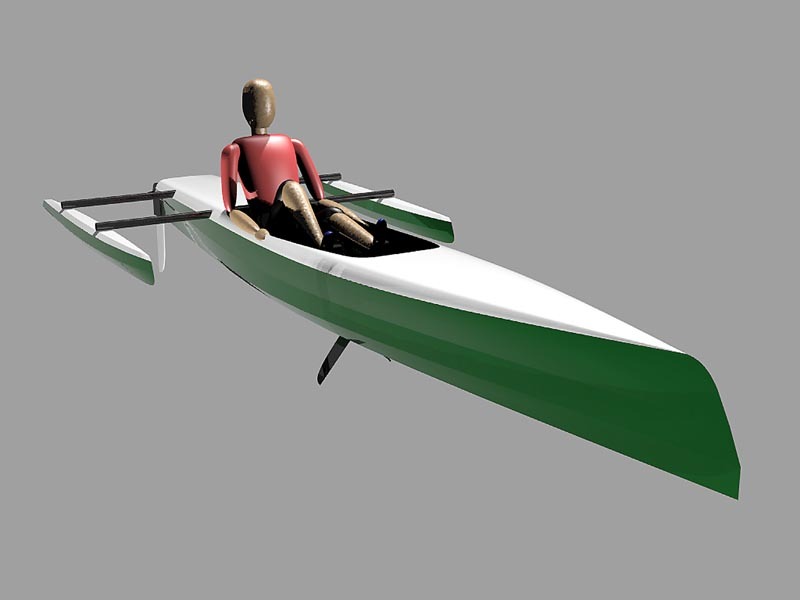 The 21 SC was, as you might guess, 21′ in length. 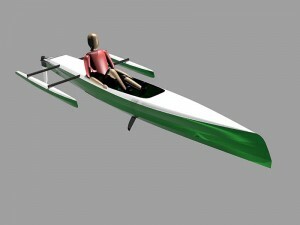 As a fixed beam design, it was limited to the typical, US trailer legal width of 8’6″. It featured a built-in cooler, an outboard mount and it had a 29′ mast carrying 222 sq. ft. of sail area (main and jib). The Neo 21 is designed to accept rigs from a wide variety of beach cats making for a reasonably easy job of obtaining a really good used rig for the boat. This feature, alone, will make for a very economical boat to build. 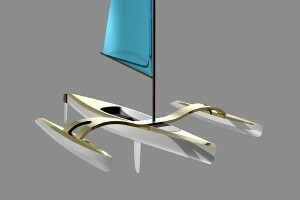 The design calls for a main and jib rig between 218 sq. ft. and 250 sq. ft. (20.26 sq. 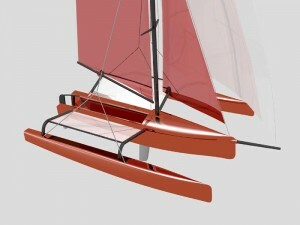 m. – 23.22 sq. m.) You can go bigger than that and no doubt some will, but you’re on your own. 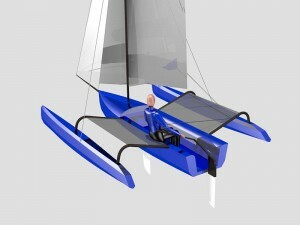 The larger rigs may require an adjustment in the placement of the daggerboard, but that’s about it. 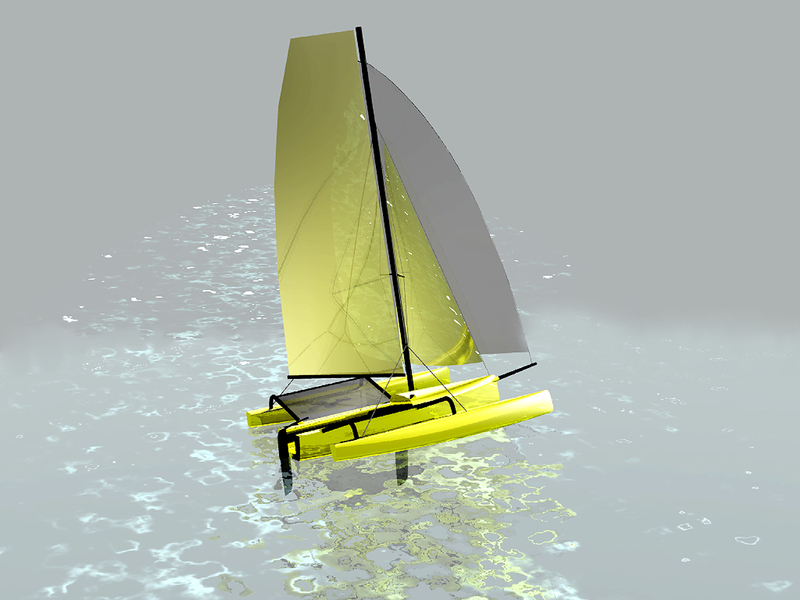 Getting away from the discussion on how big of a rig can be run on the Neo… I wanted to explore the potential of a cruisy-style beach cat that would be more stable for a young family. 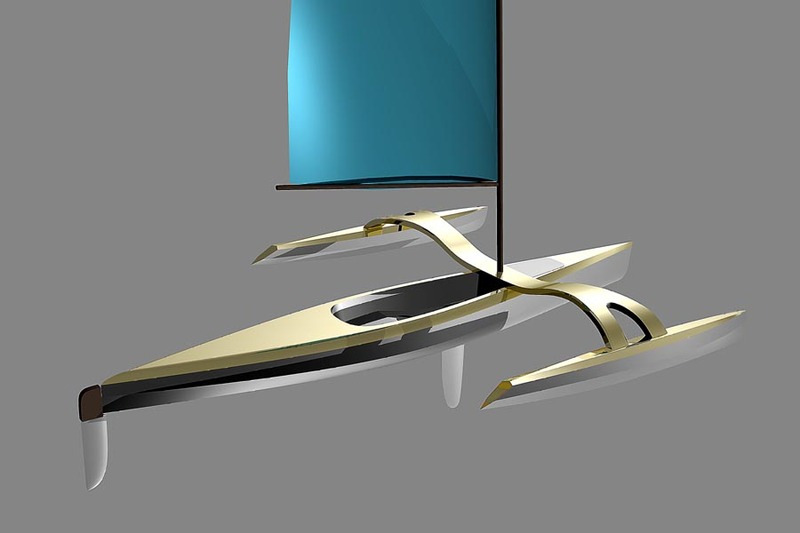 The Neo and its collection of studied variants, has been in development, off and on, for the past couple of years. The Neo is much more about spirited cruising potential than it is about shredding up the local waters with all-out performance, as one would typically see from a big beach cat with a high performance rig. The boat, while sporting a fairly wide, 11′ stance, is also carrying more weight than a typical performance cat of this length. Slightly heavier, yeah, but the Neo will show a very nice turn of speed, to be sure. 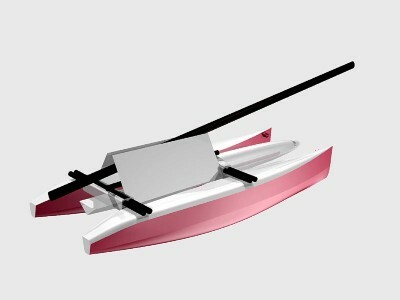 There’s a faster boat hiding within the base philosophy of this concept, but it’s going to be coming along a bit later and it will have a distinct set of design rules for a much different purpose. The typical beach cat tends to suffer from a small collection of problems that make them somewhat less than desirable for coastal, camp-cruising type applications and a full day on the water with no breaks. Low bridgedeck clearance, which is the primary cause of slamming in a choppy seaway. 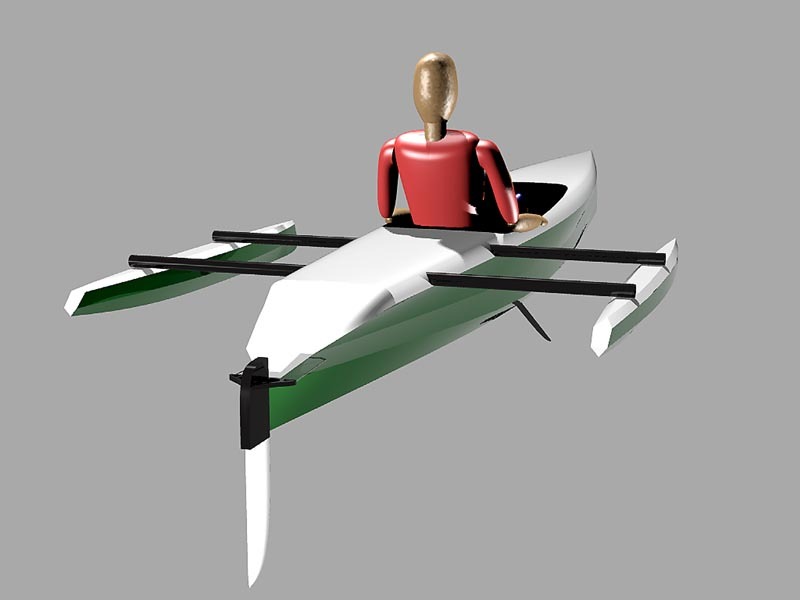 Fixed primary stability that is a lower design priority compared to the go-fast regime at which they excel. Restricted leg placement arrangements while seated on what is normally a flat hull deck and adjoining trampoline surface. 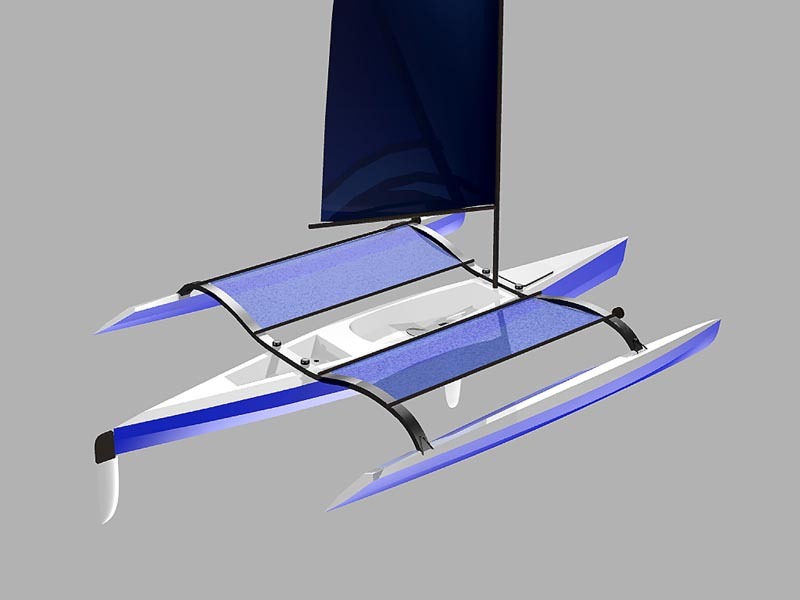 The design of the Neo 21 addresses each of these basic issues, as well as solving a few additional problems, making for a really fun, fast and stable beach style cat for coastal cruising and camping. 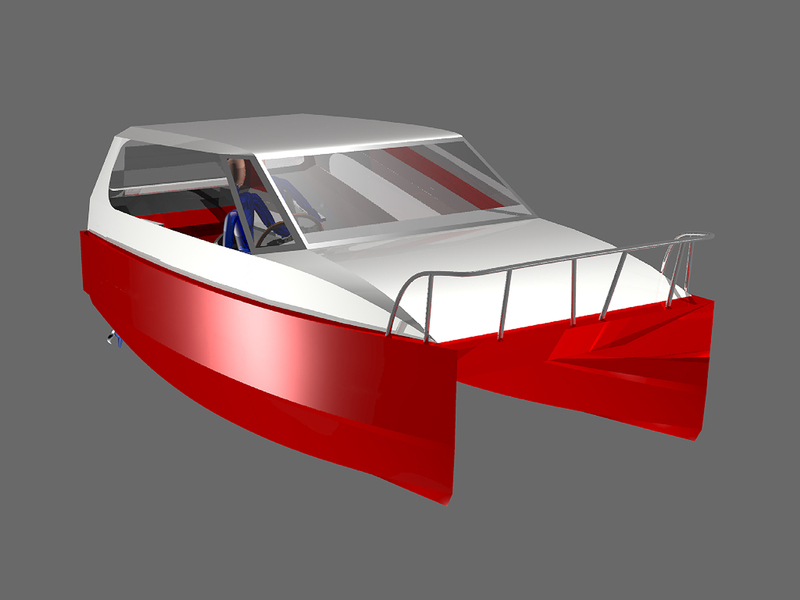 When cruising at more sedate cruising style speeds with both hulls in the water, the bridgedeck clearance of the typical beach cat is decidedly lacking. 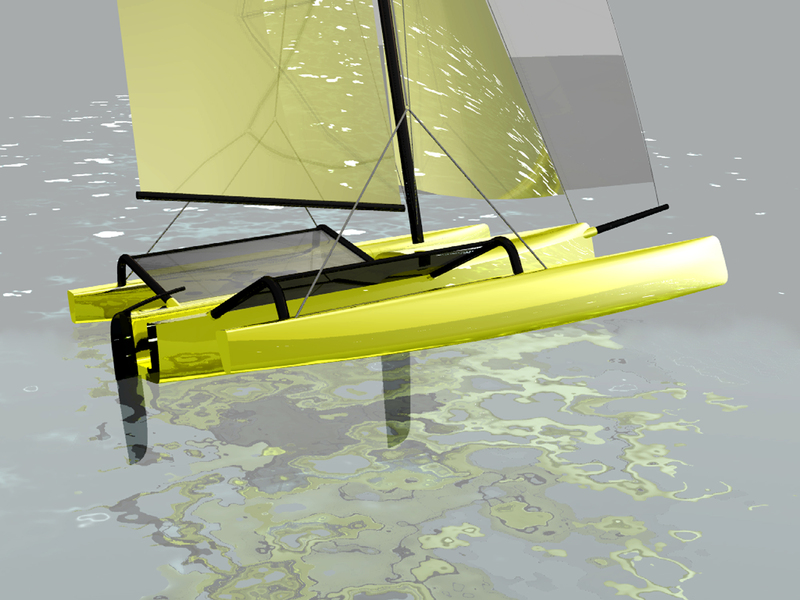 Beach cats have less clearance because the hulls are drawn to be as small as reasonably possible. 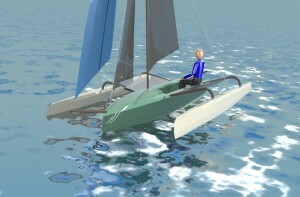 Hulls with minimized surface will reduce aero drag when the windward hull is flying. Smaller hulls will also weigh less than those with higher volumes and exposed surfaces. Lastly, when you get the windward hull of a beach cat up in the air, any concerns about slamming wave tops with the trampoline deck tend to melt away. 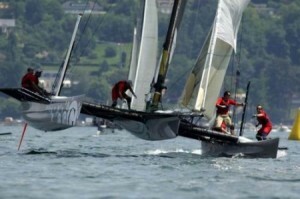 Cruising style cats are not meant to fly the windward hull, save for very controlled circumstances. As a result, the Neo hulls have been increased in height over other 20-21′ beach cats to provide 16 inches of bridgedeck clearance. This will significantly reduce pounding in choppy conditions and at the same time, provide a much drier, more comfortable ride. 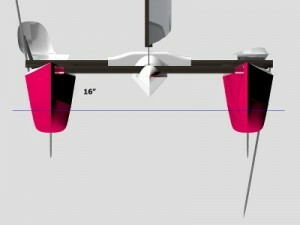 Comparing the hull height of the Neo 21 to that of a Hobie Miracle 20, you can clearly see the difference in water level clearance. Striking a balance between the typical big beach cat and some other cats with much more flared hulls, the Neo experiences a bit of both design advantages by having mildly flared hulls as a key element of their design. Because the hulls are not meant for sleeping quarters, or sitting within, the flare angle can be kept down, reducing the effect of wetted surface drag when pushing through a seaway. 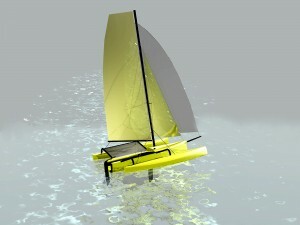 Similarly, because of the mild flare, the Neo has a lot more reserve buoyancy than a beach cat. In real terms, this means a boat that will be able to strongly resist the tendency to want to bury its leeward bow when pushed hard, or when taking a surprise gust. Not only will the skipper of the Neo 21 get more time to take action to avoid a pitchpoling incident, but he’ll have more of a safety cushion to stay way from the scenario in the first place. Cautionary Timeout: There isn’t a boat out there that can’t get tossed by wild conditions, or poor seamanship. If you decide to build the Neo 21, you will need to observe and respect all the same danger points of sailing to stay upright and moving towards your destination. Even though the Neo 21 is capable of filling many of your boating dreams, it is not a magic carpet that can get you out of any jam you manage to ignore too long. Let’s face it, one of the really great advantages of having a multihull, is the speed benefit over a monohull of the same size. 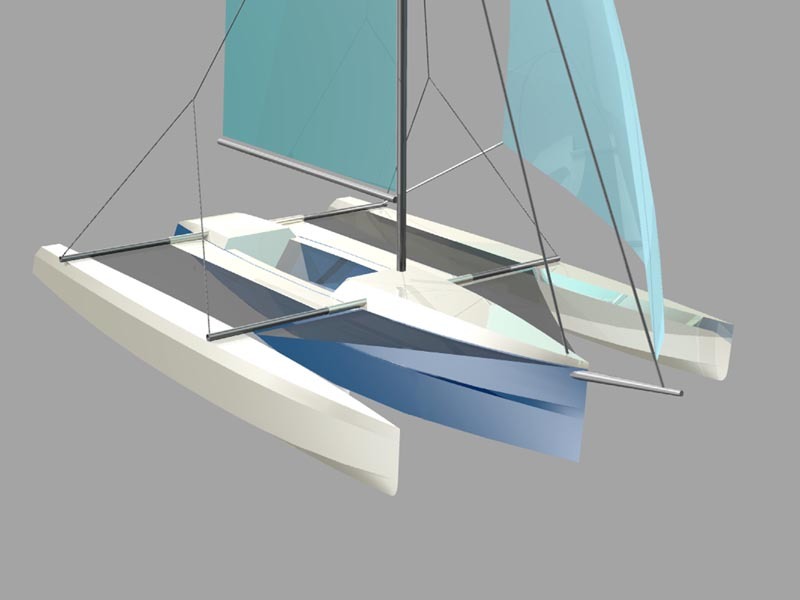 The Neo design presents an attractive hull design that is decidedly cruising oriented while retaining the key aspects of outstanding performance under sail, or motor. 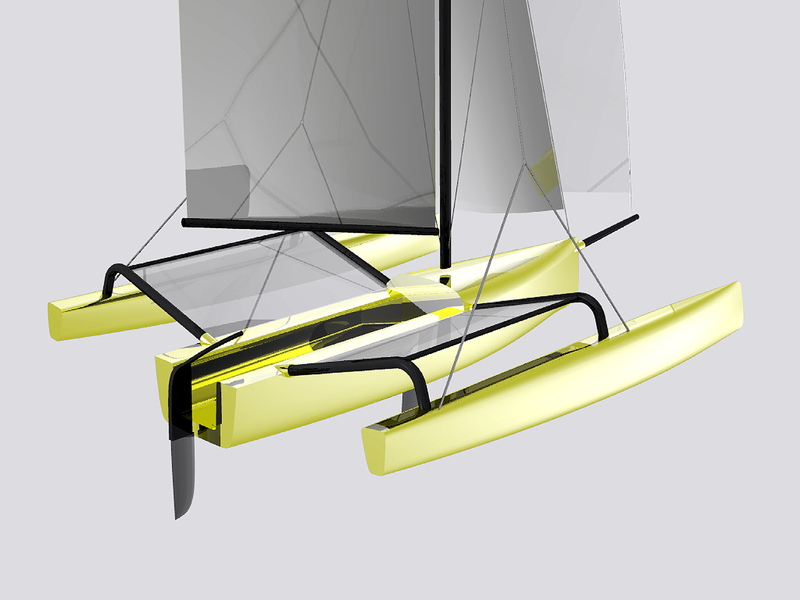 Just as important is the aesthetic impression of the Neo hulls. 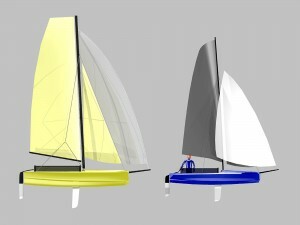 They just look fast… even when sitting at anchor. 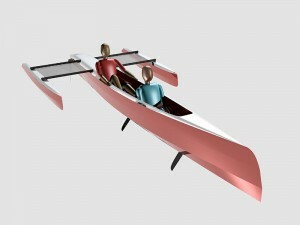 There’s more, though, to efficient boat performance than the design of the hulls. One of the key elements to overall performance and truly good upwind sailing potential is the efficiency of the jib. Jib efficiency is very closely tied to the tension of the forestay and the issue has to be addressed specifically for beach-style catamarans. 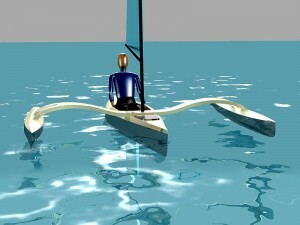 Bigger cats place a large beam at the bow and equip it with a seagull striker to maintain high levels of forestay tension. 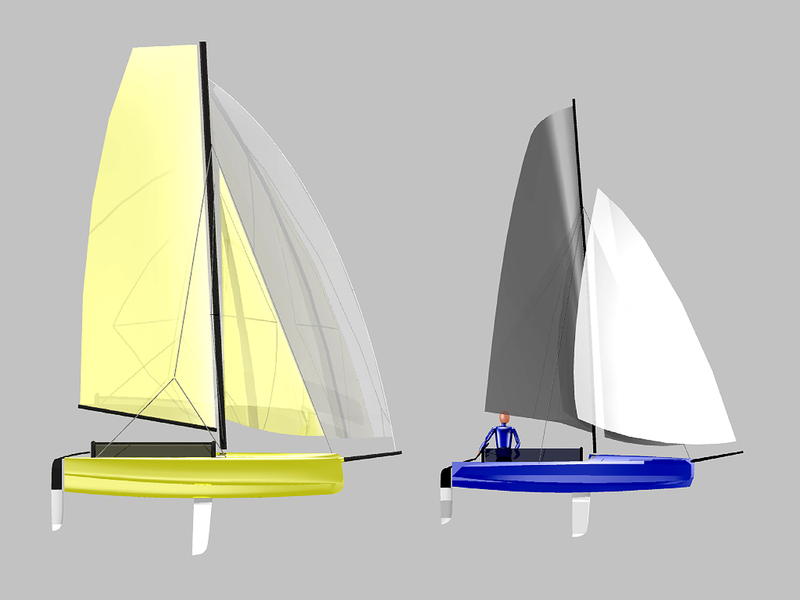 While the Neo 21 is equipped with a beam at the bow, it is as much there to provide a nice taught forward trampoline perimeter, as it is to help with forestay tension. The real power behind the forestay tension on the Neo is obtained through the central pod, which runs the entire length of the boat. 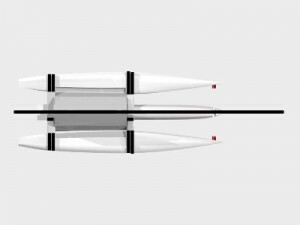 The single most striking design element of the Neo 21 is the center pod, which extends from the bow of the boat at the forward beam, all the way aft, to just past the aft beam. 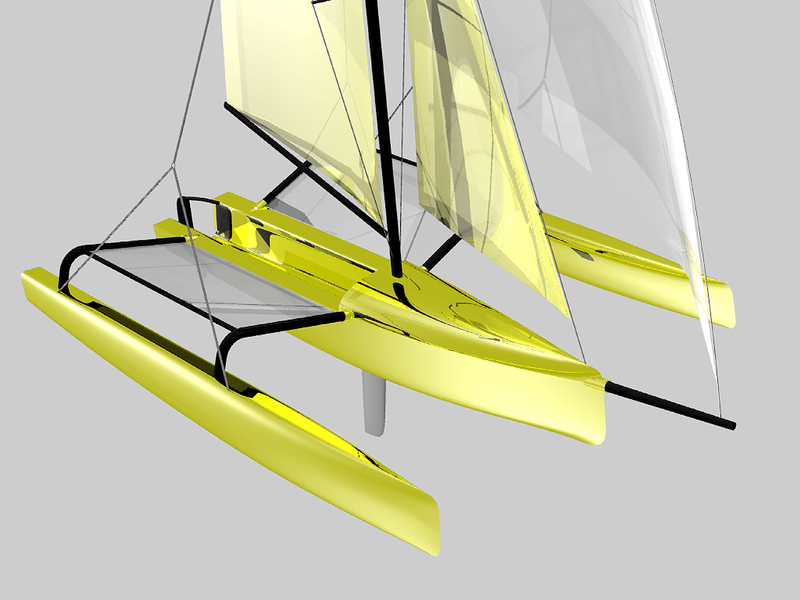 For the past several years, many of the high performance, Decision35 racing catamarans on Lake Geneva, Switzerland, have been built with these centerline pods and I found the potential to be very advantageous for the applications I had in mind for the Neo 21. 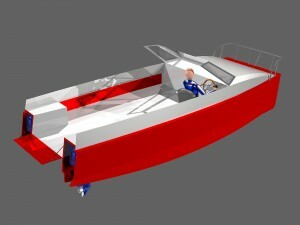 Much like the ultra high-tech, D35 cats, the center pod on the Neo performs a number of design, structural and utility tasks for the boat, not seen on other beach cats of this type. This pod acts as a structural beam fore to aft and provides solid fixing points for the sliding beams that connect the two hulls. 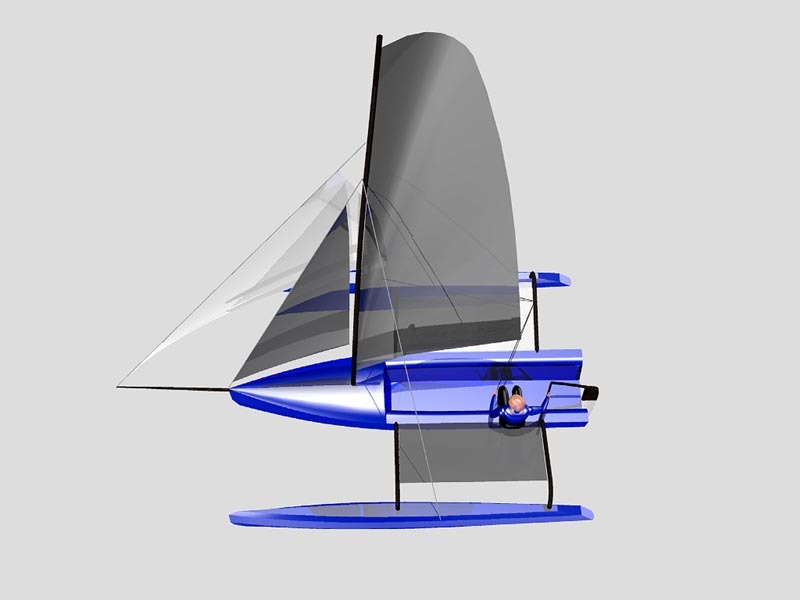 The center pod also allows for the rig to have a very taught forestay, which properly shapes the leading edge of the jib for much better pointing upwind and sail shaping. Because the pod absorbs a good deal of the compression loads of the rig, it serves to lessen the compression loading on the main beam. 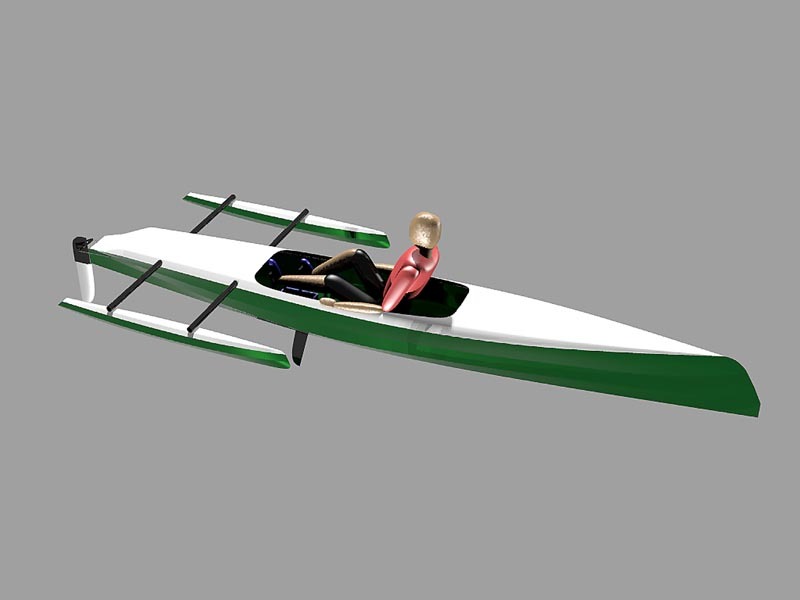 The smaller total load on the main beam allows for the removal of a dolphin striker from the engineered beam, allowing for faster setup and take-down times on the launch ramp. 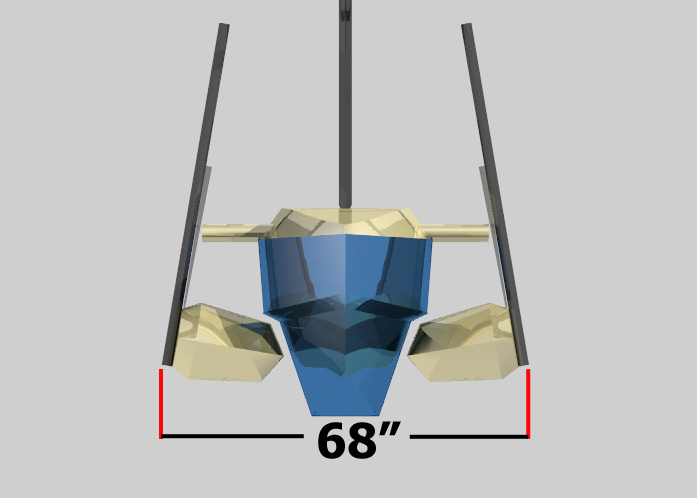 Above the deck, the trampoline deck volume of the pod serves as a storage compartment for the anchor and ground tackle while cruising and also provides a really nice back support for sitting out on the forward tramp surface. 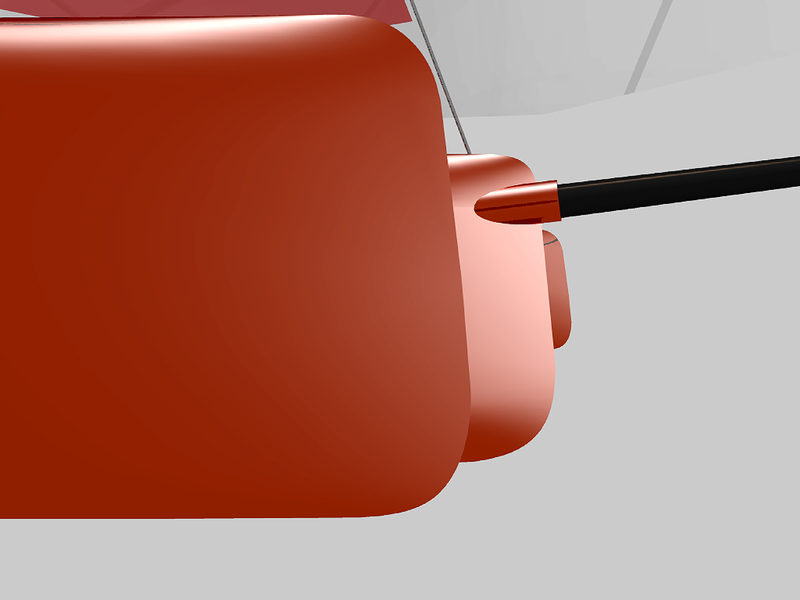 Well aft, the pod provides a very strong, outboard engine mounting point behind the aft beam sliding structure. Not in my opinion. 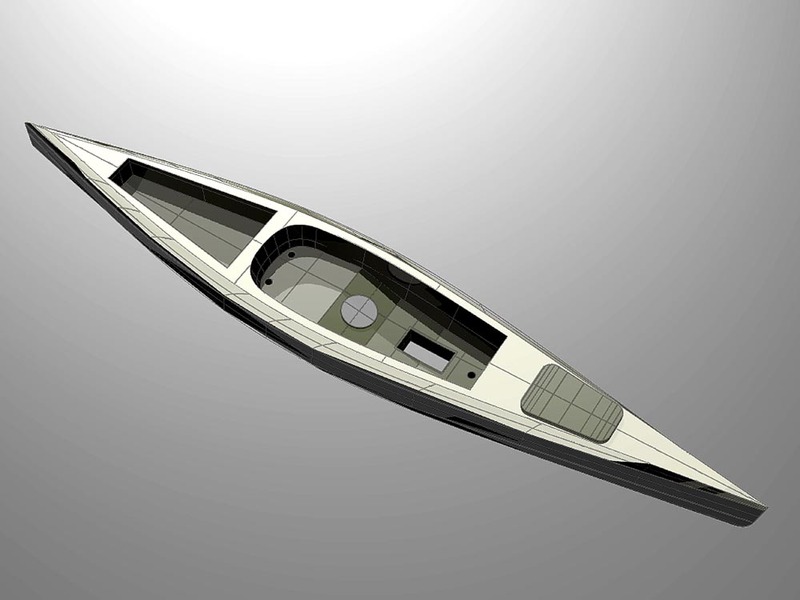 The pod is significantly smaller in height, as well as beam, than any trimaran hull might be for a boat this size and is very easily and quickly constructed. 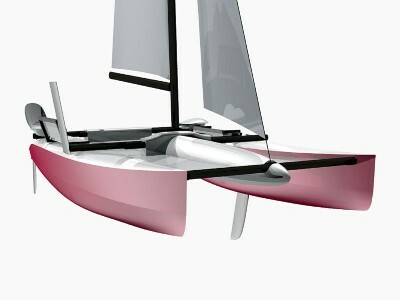 The application benefits of the form far outweigh the time, money and weight to include the pod in the build of the Neo 21. 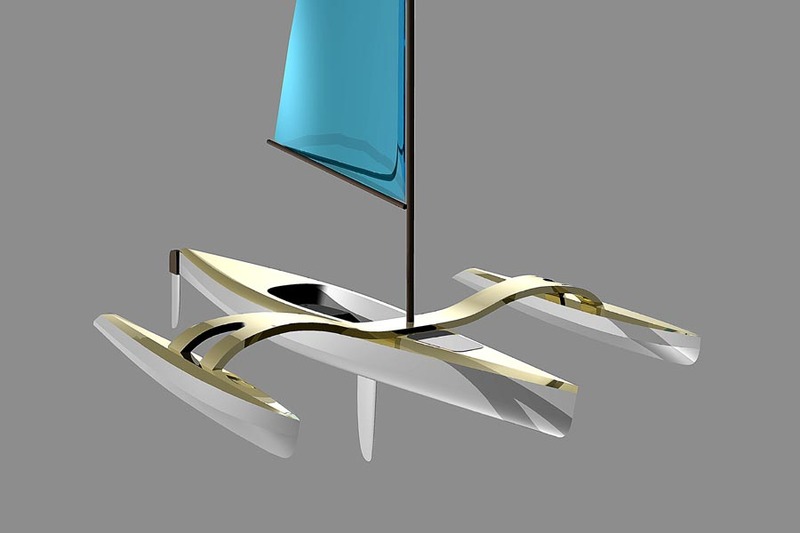 I see the pod as a clever means for spreading the powerful loads of the mast, as well as a way to comfortably keep the entire boat aligned while spreading, or compressing the beam at the launch ramp. 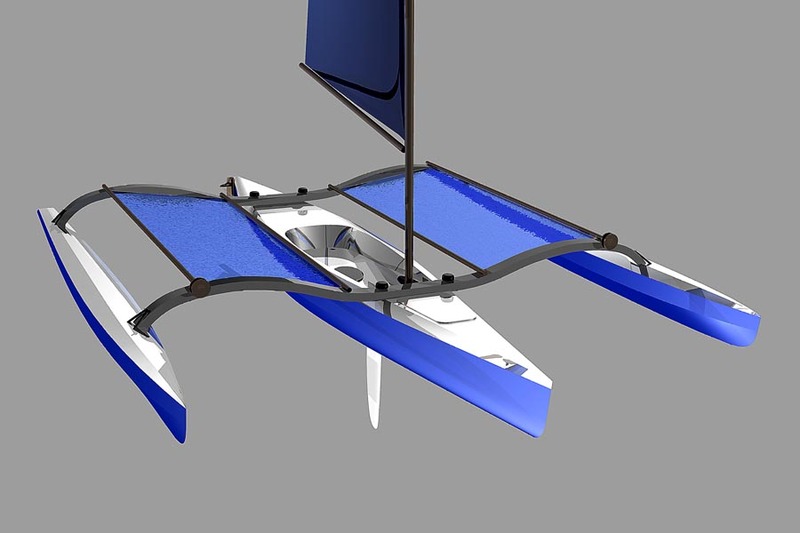 The center pod is not a principal flotation form, though it will provide for a decent degree of buoyancy, should the Neo be capsized. The images above show the graphic difference between the Neo when it is compressed for trailering and the full beam of the boat ready for sailing. 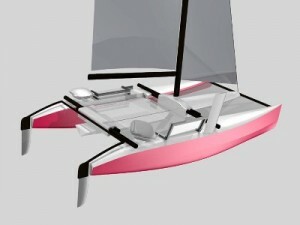 It’s pretty clear from the renderings that this is a much more stable boat than the typical beach cat with its fixed beam. 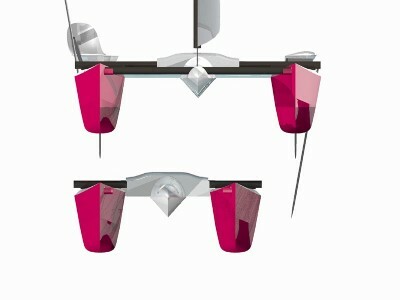 In place of these fixed beams, Neo uses three structural beam elements. The full width, removable forward beam is positioned at the bow and serves as the mounting point for the forestay, as well as the forward limit of the bow area trampoline surface. The main and aft beams are each made of two, equal diameter tube sections, which slide past one another through fixed containment structures mounted to the deck height surface of the center pod. 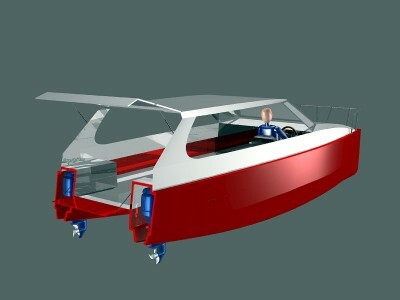 The trailering configuration of the Neo 21 is very simple after lowering the mast and removing the rudder system. 2.) 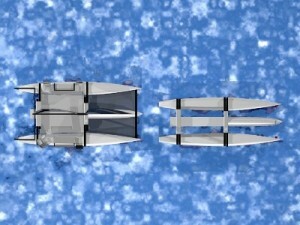 the main and aft beams slide past one another in the two containment structures and the hulls slide toward the centerline until the boat is at trailer legal width. 3. 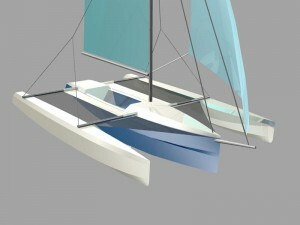 )The sliding beams are then pinned in place for trailering and the forward beam tube is bundled with the main sail and boom. As discussed previously, the standard Neo 21 is designed to use the rig (230 sq. 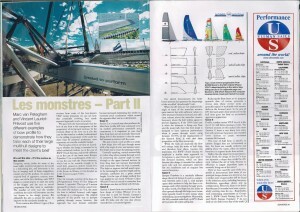 ft. of sail area), sailing hardware and rudders from a donor Hobie 18 . 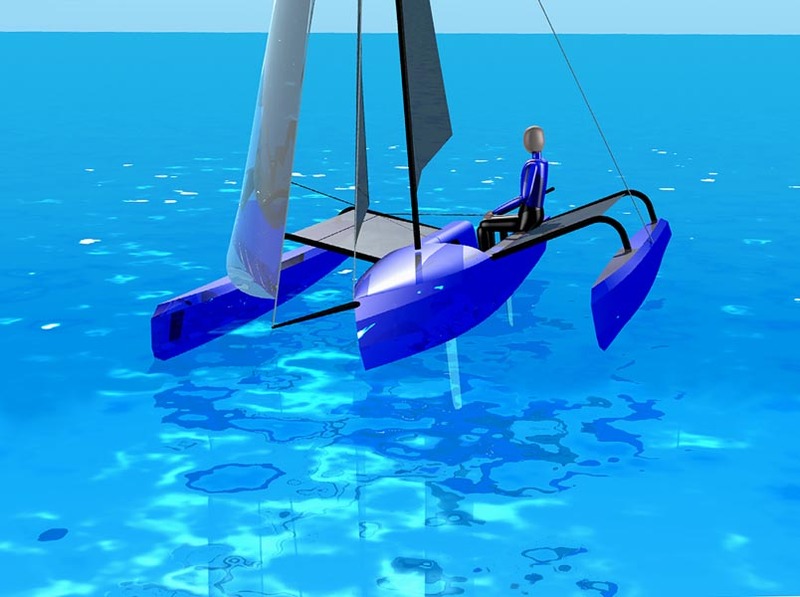 H18′s are available all over the place at near fire sale prices, so the really expensive stuff for a homebuilt boat, the rig, sails and rudder systems, are easily obtained. 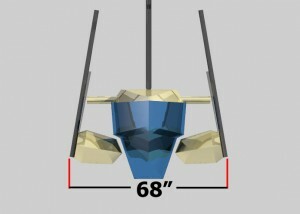 I am suggesting that the Neo be equipped with a set of mast stabilizing lines that mount to the mast at the rigging hounds and are fastened on each side of the main beam. 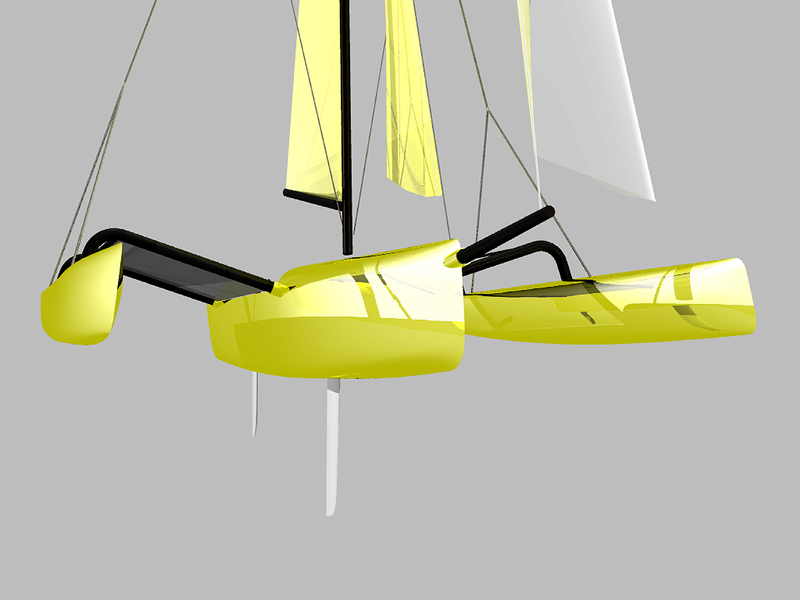 There is a gin pole that drops into a socket in the forward part of the center pod that serves as the lever to hoist the mast while the stabilizing lines keep the rig from falling off to the side during stepping. The forestay is used for this procedure with a rope extension that is quickly clipped into place on the forestay shackle. The rope is led to the hand winch on the trailer for the hoist. 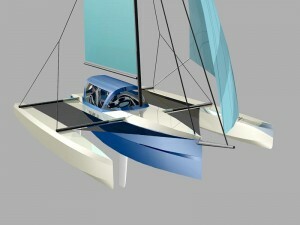 Once fully raised, the safety lines are unclipped and fastened to the mast and the forestay is shackled in place. This is an easy, simple method for mast stepping that has virtually no danger of getting out of control and can be done by one person, if they are strong enough to safely move the mast into the correct position for stepping. 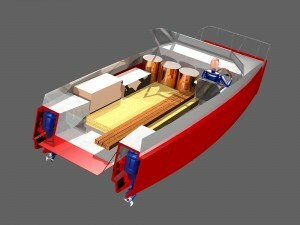 The hull pans and the rounded deck surfaces of the Neo are strip built in Western Red Cedar, or other suitable softwood. 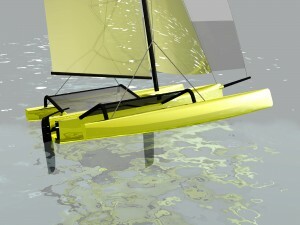 The large, planar hull sides are constructed from ¼” marine plywood. This gives the Neo the look and feel of a production boat with rounded surfaces employed where they matter most, the in-the-water hull shapes and the rounded, wave shedding surfaces of the decks. 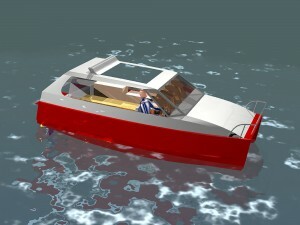 The easily fabricated hull sides of plywood have smooth, softly flared runs, bow to stern. In the cockpit, the inner edges of the hull decks are notched back at deck level to provide a nice leg angle when seated on one of the center facing cockpit lounges on each hull. 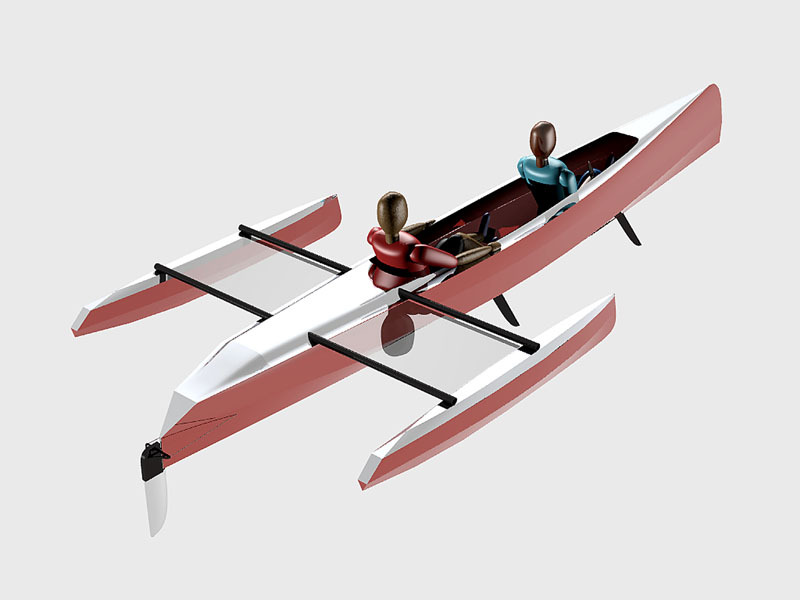 These seats are removable for transport and have backs that fold down for a more compact storage unit in the hulls. There is also a fully rotating, contour shaped skippers chair located just forward of the aft beam. 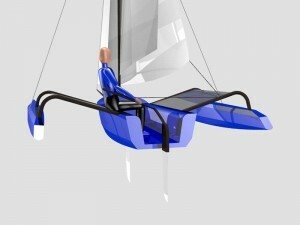 This chair gives the skipper a full, 360 degree view by just spinning around with his feet. Want to face forward awhile and talk to the other folks on the boat while comfortably driving… you can turn the seat any way you want it while having your fanny cradled in comfort. The owner/builder can even install a contour shaped seat with a reclining back feature. The guy doing the driving gets to pick how he wants to sit and in what direction he will face. The hull decks have nicely spaced access hatches and ports for easy storage of everything from the camping gear, to a built-in cooler. 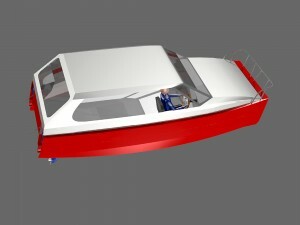 The main deck is a hard, flat surface that serves as perfect platform for tent pitching when at anchor. Along with the area provided by the notched deck surfaces, the owner can comfortably pitch a 7′x7′ domed camping tent for remarkable comfort for a family of three. I’ve seen this size of tent available for under $100, making for a great value… if you pick one that can hold together for several seasons. If the owner so chooses, they can also drop 4′ stanchions into built-in sockets at the four corners of the deck/hull area and hang a large awning over the entire bridgedeck, supported by a topping lift, or boom gallows. 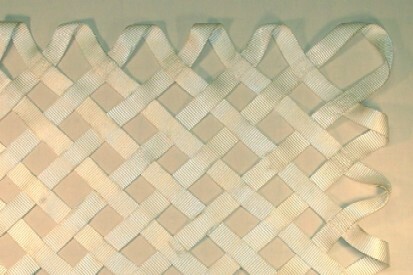 Weather covers of this type can be anything from bone simple to pretty darn luxurious, complete with no-see-um netting, depending on the desires of the owner. The advantage is that the tent volume can be extended out over the decks of the boat on each side, making for a much bigger space than a 7×7′ tent. Like anything else about boats, the final choice will be determined by preferences… and budget. Admittedly, this whole, tent camping thing on an open deck catamaran is not for everyone. 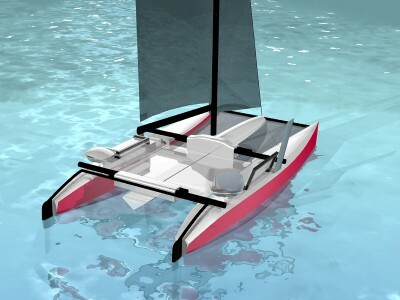 For those individuals/families who do not care for this approach, the Neo would probably not be a viable boat for your needs unless you are looking for a big, quick, day sailing beach cat. 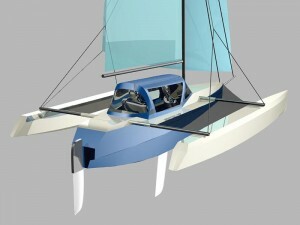 If you don’t like camping, I would suggest the build of my Gato Especial design at 21′ LOA. The Gato has a full cabin with interior room for a queen-sized bed, a small galley and a compact space for a port-potti that can be screened for privacy. 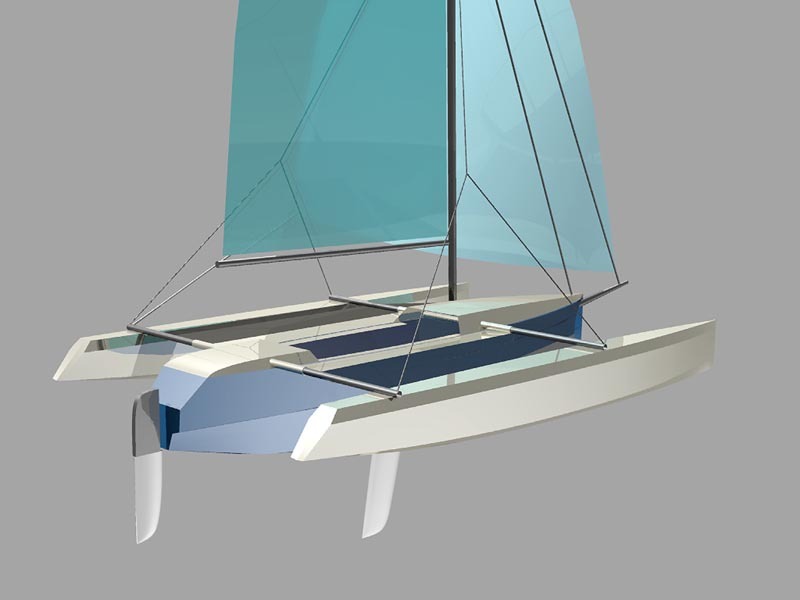 The deck surfaces of the Neo are hinged, accordion fashion and folded to a vertical position for the sliding together of the hulls for trailering. 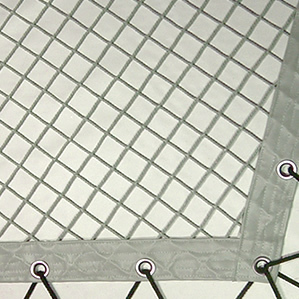 As an alternate thought, the solid floor could be eliminated from the design in favor of a dual trampoline surface. The tramp would be built with a simple aluminum tubular frame that also hinges on each hull and folds into place for sailing. 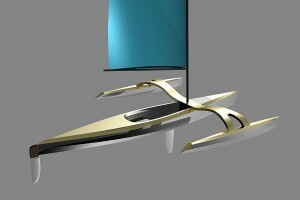 Just like the solid floor, it would also be folded up and out of the way for the sliding beam process. 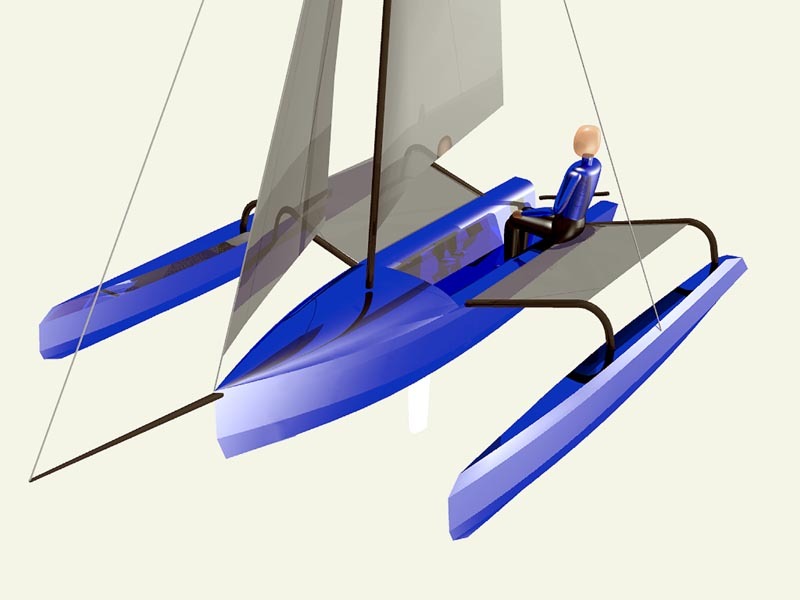 It would provide a lot less side windage while being trailered, but also allow for spray and wave action to reach the bridgedeck while sailing. No free lunch with design choices. The cockpit notches in the main hull also provide strong creature comfort for long sailing sessions, as the crew can bend their legs while sitting on the removable, fold-down seats on each hull. This feature immediately takes the boat away from the typical, tiring beach cat arrangement of having your legs straight-out on the trampoline surface for hours on end.